To record a partial area of your computer screen, start Bandicam and select the 'Rectangle on a screen' menu. The 'Rectangle on a screen' recording mode allows you to record a specific area in the rectangle window. How to record a certain area of the computer screen. 1. Download Bandicam from the official website (https://www.bandicam.com/downloads/). 2. 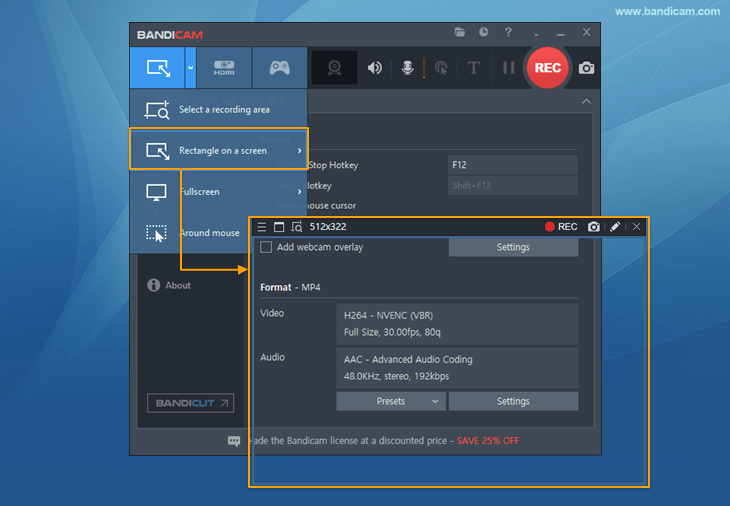 Start Bandicam and choose the 'Select a recording area' or 'Rectangle on a screen' menu. The rectangle recording window will be shown on your computer screen. 3. Click the '● REC' button or press the hotkey (F12) to start/stop the recording. 4. Go to 'Home -> Video' to play, edit or upload the captured videos. * A real-time drawing function while recording the computer screen Users can simultaneously add arrows, boxes, numbers or highlights while recording in 'Screen Recording' mode. 'Screen Recording' mode allows you to record everything on your computer screen and draw lines, boxes, or highlights while recording. Bandicam is one of the best screencasting software.